Which they’ll be enough to pass through an A+ in SSL Labs . SSL Offloading. Note that this version includes new SSL Offloading capabilities which increases performance on CPUs AES compatible. If your hardware implements this capabilities this option will be shown. Other wise not. Available certificates. These are the available SSL certificates installed in the device. 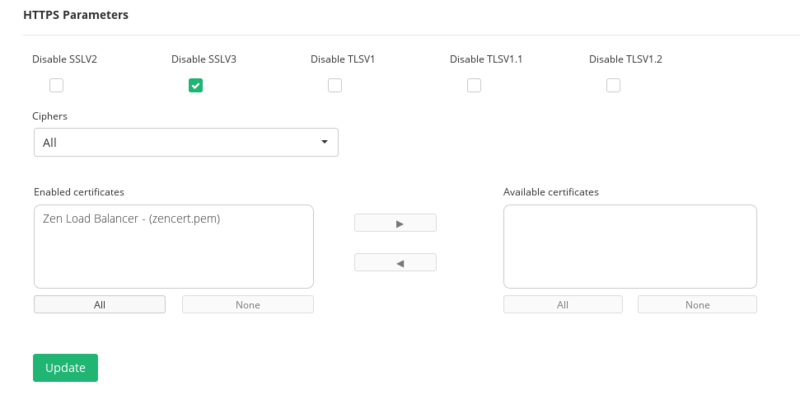 To enable one of them you could either select the certificate and press the arrow button or you could simple drag and drop it from the Available box to the Enabled box. Logs. 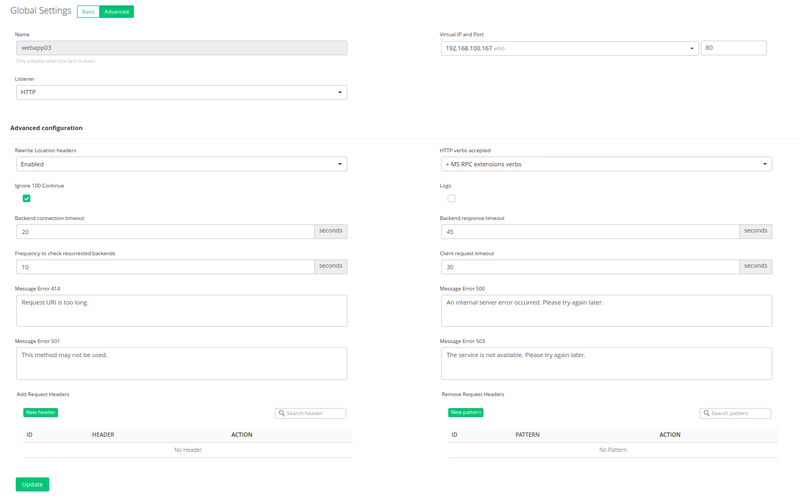 Enable or disable farm traffic logs that is passing through the load balancer. Personalized error messages. Through the personalized error messages, the farm service is able to answer a custom message of your site when a web code error is detected from the real servers. A personalized HTML page will be shown for error codes 414, 500, 501 and 503. Add Request Headers. List of headers that will be added to the client HTTP requests. Remove Request Headers. List of header patterns that will be removed from the client HTTP requests. 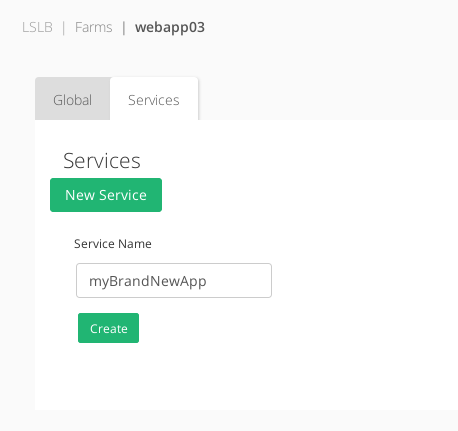 After the creation, you will be asked to Restart the farm in order to apply the new service. Once the new service is applied, the HTTP services are evaluated top to bottom in the list order, the first service to match both conditions will process the request. Those services conditions could be determined by URL patterns, specific headers or redirection and allows to identify several web services in through the same farm. The Virtual Host and URL pattern values are regular expressions, if they are left empty any value will match. Both fields must match or it’ll jump to the next service. It’s recommended to include one last service as the default one if there is no match detected. HTTP Strict Transport Security, or HSTS, is a web security policy to prevent threats during the web traffic communication or cookies disclosure. Web browsers need to support this option. By default, in HTTPS farms is enabled in all services. STS Header. Checkbox to enable or disable this option. Timeout. Timeout of validity of this header. If the service has the redirect option enabled, then the backend servers can not be used as all the requests will be sent to the specified URL. Redirect Type. There are two options: Default or Append. With the Default option, the URL is taken as an absolute host and path to redirect to. With the Append option, the original request path will be appended to the host and path you specified. Redirect Code. There are several redirect HTTP codes that could be used: 301 (Moved Permanently), 302 (Moved Temporarily) or 307 (Temporary Redirect). Cookie insert. If defined, the HTTP farms will inject a cookie in each response with the appropriate key of the backend, so that even if the session table is flushed or sessions are disabled, the proper backend will be chosen. This feature avoids to change the real server code to create a session cookie. HTTP farms provide a basic and intrinsic health check to the backends but the Farm Guardian configuration is recommended to create smarter heuristics to the backends in order to ensure the real application health. Some built-in or customized advanced health checks can be assigned to this service from the already created farm guardians checks. For further information about Farm Guardian go to the Monitoring >> Farm Guardian section. Finally, in order to apply these changes, it’s needed to click on the green Update button and a confirmation message will appear at the left bottom corner of the browser. All the backends must be IPv4 or IPv6, with the same IP version as the Farm VIP. ALIAS. Backend alias, if any alias was selected. IP. The IP address of the given backend, if you has selected any alias, this field will be not editable, you should change the alias field. If you has selected ‘Custom IP’ in the alias field, it will be editable for the desired IP. Disable Maintenance. This action is available if the backend is maintenance. Enable new connections to the real server again after the enabled maintenance. Delete. Delete the given real server of the virtual service. The alias is not deleted. Save. Save the new real server entry in the given service and start using it. Add Backend. This option open the backend addition form. In addition, you can modify a previously added backend, if you put the mouse pointer over the fields you can see which fields are editable and edit it clicking over it. The modify will be send when you press the enter key or when the field lose the focus. Actions button permits to Add a new Rule as shown in next image. It also allows to Unset, Enable or Disable a given rule. When you unset a rule is removed from the rules list related to the farm. Enable or Disable actions makes the rule to set it up or stop it, respectively. Once you add a new IPDS rule you should select from the list the rule(s) (multiple selection) you would like to apply, like it’s shown below. After selecting the rule to be applied you will see a screen where your new rule associated to your farm. Initially the Status of the rule is Down. In order to activate the rule you need to press the green play triangle icon under Actions column. It will prompt a message notifying that the rule is activated.